After a laser-focused start, this series inevitably widens its scope to give us some idea about what, exactly, the hell is going on. 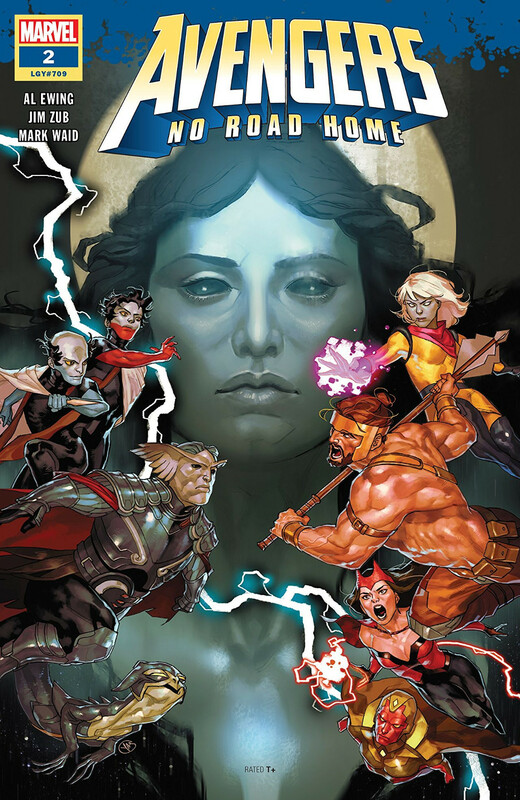 We learn more about Nyx and her plans, meet her "children," and see the Avengers get absolutely cream-u-lated in their first stab at fighting her. We're also taking all this in through Clint Barton's eyes, a narrative conceit that has both benefits and drawbacks. Let's get straight to the drawbacks: Clint is narrating up a storm in little purple boxes, right from page one. But the first act is a flashback showing Voyager and the Challenger watching Nyx's merciless assault on Olympus. It's stuff Clint can't possibly be privy to, and that drives a wedge between his narration and the rest of the story. At one point, we're watching the death of Zeus, with cutaways to the Elders watching it, with Clint's barely-connected narration laid on top of both. When the Challenger's dialogue starts spilling over into the Olympus scene, we get two different divergent caption streams over one very eventful page. That cannot be the best way to tell that part of the story. The good news is, narrative confusion aside, this continues to shape up into a tremendously inviting tale. Nyx and her children make compelling antagonists, and their arrival is tied to No Surrender with infuriatingly clever "exact words" logic. A roadmap for the future is sketched out: Nyx's power was significantly reduced when Zeus stole her "Night Shards." The Avengers' obvious role is to race her children to the MacGuffins lest Nyx become absolutely unstoppable. It's almost too pat; fortunately, it's not the only story thread running. This issue being lodged thoroughly in Clint Barton's head begins paying off after the first act. His view of the team's desperate fight with Nyx is compelling, and his concern for the Scarlet Witch is much appreciated. And as promised by the solicit, the final scene sees Clint pay a significant price. It also sets up a nasty personal cliffhanger for him; I desperately hope that the story sticks with his point of view for at least one more scene in #3. This issue's script lays a lot of challenges on the art team, and they pass with flying colours. It takes considerable "under the hood" skill to organize big battles with lots of participants and push a complicated narrative thread through them. This is done magnificently, while also making space to introduce Nyx's children without slowing down the breakneck pace. Speaking of flying colours, the palette is another place for audacious complexity. Nyx obviously cries out for cold, dark colours, and these are provided without shortchanging the colourist's usual high-intensity selections. The final scene is another nicely-nuanced moment, dialling things back to icy blues against which shocking purple and green stand out all the more. The second installment of No Road Home lands with a lot of complications, not all of them positive. Narratives get muddled in the first act, but the plot hammers itself back into shape with some powerful developments further on. The challenge Nyx presents grows dreadfully clear, and the story still crackles with "and then what happened?" excitement. I'm really pleased to see more character development for Voyager. Not exactly counting the moments until the Challenger comes back, though.